On 29th of February, a day before the opening ceremony of the Women’s World Chess Championship Match, Mariya Muzychuk and Hou Yifan, a number of officials and team members together with a Chief Arbiter of the Match Carol Jarecki inspected the playing venue: Potocki Palace. The players performed the usual checks: they tested their chairs, table and light in the playing hall. After the inspection the Mayor of Lviv Andriy Sadoviy, Hou Yifan, Mariya Muazychuk and the Chief Arbiter shared their impressions with local journalists. 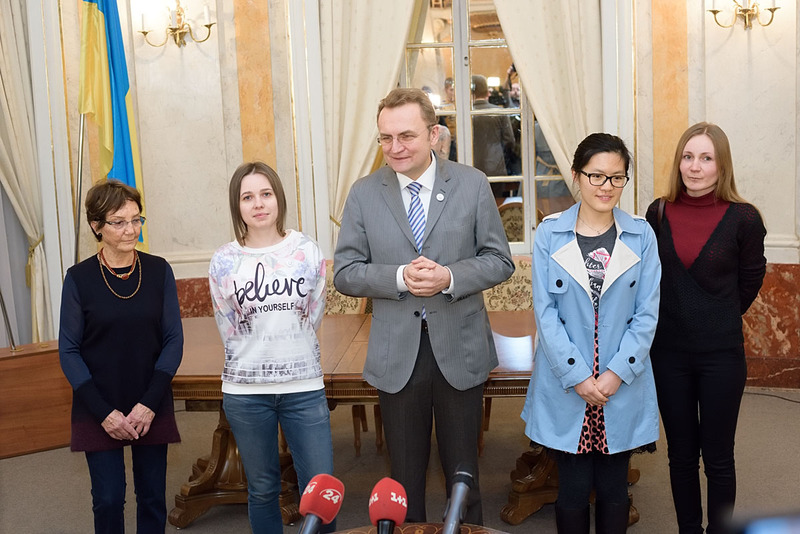 “It’s a great honour for our city to welcome three-time Women’s World Champion Hou Yifan and current Women’s World Champion champion Mariya Muzychuk in Lviv. It’s going to be an interesting match between them and the next chess queen will be decided here in Lviv. I wish everyone to enjoy the games”, said the Mayor of Lviv Andriy Sadovyi. “It is amazing that the Match takes place in Lviv. I’m still trying to believe it. In fact, I rarely participate in chess tournaments in Ukraine, but I want to believe that over time it will be changed. We are really satisfied with a playing hall and rest rooms”, said Mariya Muzychuk. “I’m for the first time in Lviv, and in Ukraine. The city is very beautiful and I’m glad to have the opportunity to take part in the championship. I hope that the match will be interesting to all spectators in Ukraine and worldwide”, added Hou Yifan. “The city is fantastic, very beautiful. I am sure that both participants feel very comfortable’ here,” noted Carol Jarecki, a Chief Arbiter.